Orders are normally shipped via Priority Mail 3 to 5 days after we receive payment. Please let us know if you have an upcoming race when placing your order. 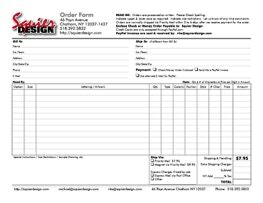 All orders are produced as written or typed. Indicate upper and lower case as required. Please indicate any size restrictions. Enter your numbers/letters in the proper box exactly how you want them. If you want a 24 enter 24 in the box, do not enter 2 on one line and 4 on the next line. It is NOT necessary to state that 24 is a number. No need to write: Number: "24"
Send us your order through email and we can email you back with a Squier Design - PayPal Invoice. Inside our return email to you will be a direct link to the PayPal site where you can pay the invoice with a credit card. As soon as we receive notice of your payment we will process, create and ship your order. Overnight Shipping via the US Post Office is available at an extra cost. We prefer PayPal.com payments and we will also accept check or money orders. At trade shows or the race track we will accept cash. All orders ship after we have received your payment. E-mail us with any questions you have about placing an order.